Our renowned dark roast, incorporating coffees with naturally large body and sweetness. Brewing Method: We recommend Espresso, Drip, or French Press for best brewing results. From John Welty of Durango, Colorado on 3/7/2019 . Absolutely our favorite coffee, Americano and Lattes can't be beat. Keep up the good work! From Sidney Bonte of Medford, Oregon on 1/25/2019 . 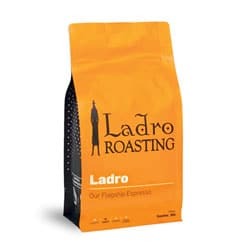 I've been mail ordering Ladro Espresso since March of 2018 when i first discovered Caffe Ladro while vacationing in Edmonds Washington. I begin my day with a 12oz quad latte every morning. But lately i wanted more chocolate notes in my latte. 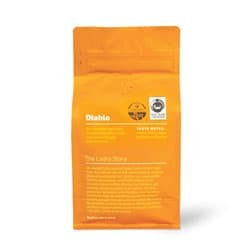 I took a look at all the other beans Caffe Ladro offered and selected Diablo based on the taste note listed: walnut, brown sugar, & bakers chocolate. Sounded like just what i was after. Ordered a bag with my next order and now use a combination of Ladro Espresso and Diablo for my morning latte. They're better than ever. Thank you Caffe Ladro! From Anonymous of Buffalo, New York on 10/28/2018 . From Susan Sweitzer of North Bend, Washington on 10/12/2018 . Robust but not bitter. This one may become our favorite espresso. From Anonymous of Noblesville , Indiana on 9/13/2018 . Perfect for making cold brew, delicious! From Anonymous of Syracuse, New York on 4/5/2018 . From Michael Holloway of Urbana, Illinois on 3/4/2018 . From Anonymous of Coupeville, Washington on 10/7/2017 . From Stacy CR of OMAHA, Nebraska on 9/21/2017 . From Anonymous of Fountain Hills, Arizona on 8/2/2017 . Very good coffee. Hard to put into words, but I would say; very smooth, not bitter, you don't feel you want to throw away the last ounce or two as you do with some coffee. 4/13/2016 – Tobacco leaf?! I love this coffee, but I need to ask - is there any nicotine in it at all? Response From Caffe Ladro: No tobacco (therefore no nicotine is present) is used in the roasting of this coffee. 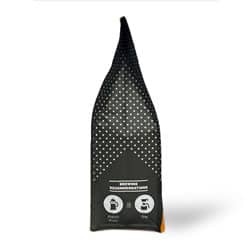 The tasting notes on the bag indicate the flavors you will find upon brewing. 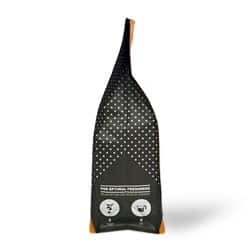 Those flavors occur naturally based on the variety of the bean, the soil and environment in which it was grown and the amount of time it was roasted.